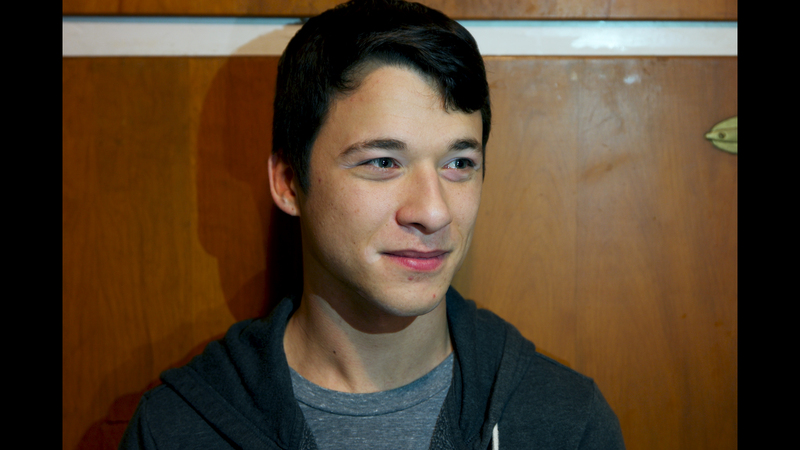 Augury, Shared Sorrow and Resonance! 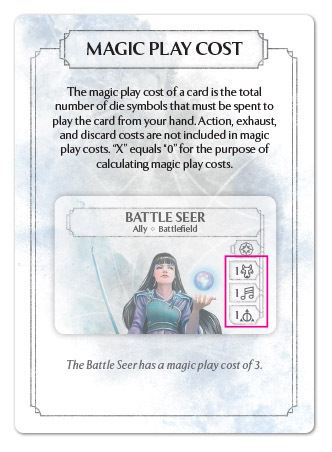 Magic play cost is a new term that denotes how many dice a card costs to play. This value is important for some upcoming cards, including the ready spell Augury! Augury is a curious spell in that is allows you to slowly but surely search your draw pile for specific cards based on their magic play cost. Augury will typically search for a 3-cost, 2-cost, and 1-cost card over three rounds. There are a lot of options for this type of effect and I look forward to seeing what groups of cards players will be searching for! Here we have another sympathy spell focused around the magic play cost of cards in your hand and discard pile. 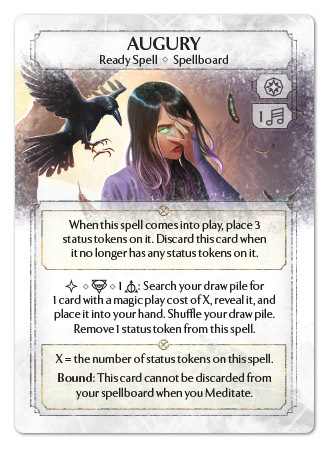 Shared Sorrow is a combination of a recursion effect and unit removal all in one! 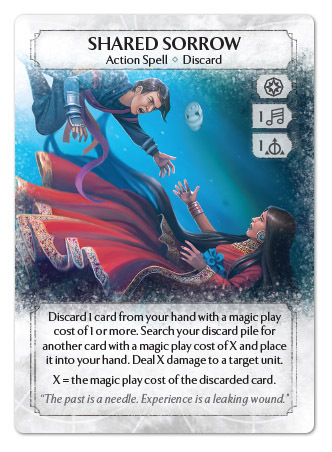 The higher the magic play cost of the card you discard, the more damage you will deal to a target unit in the process. Do note that the card you choose to return to your hand must have the exact same magic play cost value. Will you cycle out some expensive 3-cost allies to deal the most damage with Shared Sorrow? Or perhaps you’ll pass on dealing much damage to return some essential 1-cost spells that have been meditated away. Whatever you choose, this card has a lot of potential and is another open-ended approach offered up by sympathy magic. 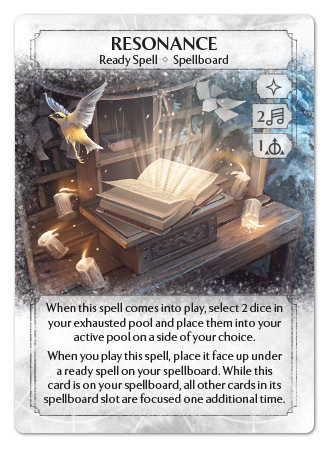 Lastly, we have what is sure to be one of sympathy’s quintessential ready spells: Resonance! This spell does it all! Primarily, you can add Resonance to another one of your ready spell slots to increase the focus of those spells. Books like Summon Indiglow Creeper get ridiculous value if you can quickly focus them, so be sure to explore what focus effects you want to unlock early! In addition, Resonance allows you to recur two exhausted dice when you play it, allowing for great flexibility in managing your dice pool. If that wasn’t enough, the magic play cost of Resonance is very important at three. Resonance can be the first card you search for with an Augury, and is another great card to get maximum damage from your Shared Sorrow! Together, these new tools for sympathy magic open up a lot of creative options. I hope you look forward to using them in a wide variety of decks! Check back here next week as we conclude our previews for these exciting new Ashes expansion decks! Remeber, the Ghost Guardians and the King of Titans are available for preorder now!